Below are the official 2018 Hockomock League Golf All Stars, selected by the coaches in the league. Milford @ Sharon – Postponed to Wednesday, 10/24 at 6:00. Taunton @ Oliver Ames – Postponed to Wednesday, 10/24 at 6:00. MIAA D1 South Sectional – Mansfield and King Philip had top 10 finishes at the MIAA D1 South Sectional held at South Shore Country Club in Hingham. 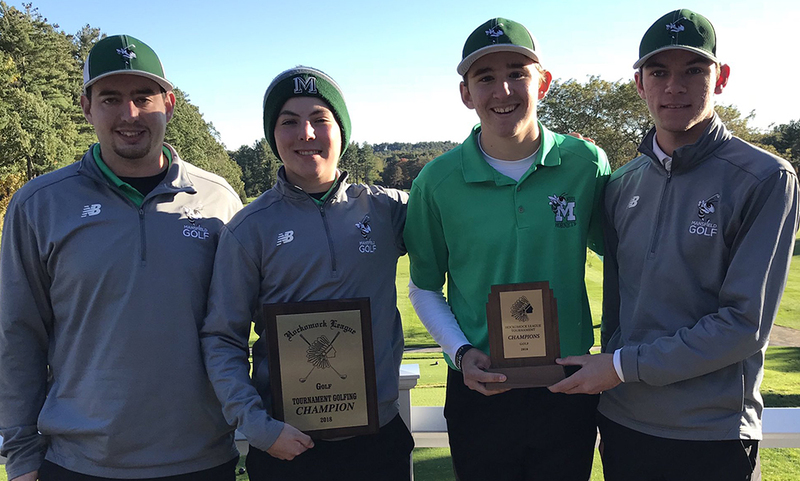 The Hornets, fresh off winning the Hockomock League Championships team title last week, had the top team finish among Hock teams, shooting 333 as a team for seventh overall. King Philip (338) tied for eighth and Franklin (364) took 13th overall. Mansfield sophomore Jason See was the top individual among the three Hock teams, shooting a six-over par 78 and will advance to the state tournament. Mansfield sophomore Joseph Gormley and King Philip freshman Michael Matheson each shot 81. The Hockomock League Golf Championship took place on Thursday at Blue Hill Country Club in Canton. Below are the team and individual results. Click here for a photo gallery from this event. Attleboro, 0 @ Oliver Ames, 2 – Final – Oliver Ames scored once in each half, earning a 2-0 win over Attleboro to punch its ticket to the state tournament for the 10th straight season. Sophomore Anthony DaCosta gave the Tigers the lead in the 14th minute, hitting a half volley at the top of the box. DaCosta’s shot deflated off an Attleboro defender, catching the keeper going the wrong way. In the second half, sophomore Colin Milliken made it 2-0 in the 58th minute. After a long ball forced the keeper way off his line, Milliken collected the loose ball and lofted a shot from 40 yards out into the open net. Canton, 2 @ Stoughton, 0 – Final – Canton took an early lead and added a late insurance goal to pick up two points against Stoughton. Paul Corcoran and Griffin Roach each scored once for the Bulldogs. Stoughton’s Fabio Ponce de Leon hit the crossbar just before half as the Knights nearly tied it before the break. Nolan Gerome had 23 saves in net for the Knights. Milford, 2 @ Foxboro, 2 – Final – Milford took a late 1-0 lead in the first half, Foxboro stormed back in the second half to take a 2-1 lead but the Hawks equalized just minutes later to earn a draw on the road. Jordan Borges put Milford up in the 39th, heading in a free kick from Tiago Carvalho. Nic Beigel tied it 1-1 in the 52nd minute on an assist from Shane VandenBoom. VandenBoom then set up Dylan Barreira in the 64th minute for the 2-1 advantage. Milford leveled the match six minutes later when Anthony Salvador found the back of the net on an assist from Lucas Caetano. Borges and Leo Coelho both had strong games for the Hawks. Mansfield, 0 @ Franklin, 0 – Final – Franklin goalie Jack Rudolph thwarted a dozen scoring chances and the Panthers’ team defense helped keep the Hornets off the scoreboard in a scoreless draw. Rudolph had 12 saves while Mansfield keeper Anthony Salisbury also had a shutout. King Philip, 3 @ Taunton, 4 – Final – Taunton raced out to a 4-0 lead in the first half and then had to hold off a furious rally from King Philip in the second half to get the win. Mateusz Hagemajer had a natural hat trick, scoring the first three goals of the game, opening the scoring in the 9th minute off an assist from Evan Melo. Hagemajer made it 2-0 off an assist from Brett Beaulieu in the 16th minute and 3-0 in the 24th minute. Alec Nunes made it 4-0 in the 31st minute. King Philip scored three times in a 20-minute span in the second half. Jimmy Dumont (40’), Stephen Griffin (55′), and Zac White (60′) each scored for KP. Oliver Ames, 1 @ Attleboro, 0 – Final – Oliver Ames’ Caroline Peper made her mark in her first varsity game, scoring the lone goal to help the Tigers earn two points on the road. OA head coach Britt Sellmayer said Brianna Gibson, Emma Pereira and Olivia Carroll played well for the Tigers. Stoughton, 2 @ Canton, 8 – Final – Stoughton’s Mackenzie Manning scored both goals for the Knights, with Hannah Papagno assisting on the first strike. Manning added a second from the penalty spot. Milford, 0 @ Foxboro, 2 – Final – Click here for a recap and photo gallery of this game. Franklin, 2 @ Mansfield, 1 – Final – The Panthers edged Mansfield in a back-and-forth game behind goals from Sam Powderly and Sydney St. Marie. Sydney Mulkern scored the goal for the Hornets. With the win, Franklin moves to within just one point of league-leading Mansfield. North Attleboro, 5 @ Sharon, 0 – Final – Ashlyn Gaulin had another big game for the Rocketeers, as the league’s leading scorer had a hat trick and an assist to keep North three points back of Foxboro in the Davenport. Lexi Sinacola and Kayla Pasquel also scored for North, while Emma Noreck and Regan Fein split time in goal to keep a clean sheet. Hannah Davis, Lauren Pezzi and Tess Collins also played well for the Rocketeers. Taunton, 0 @ King Philip, 7 – Final – Jenna Hitchens led the way for the Warriors with a hat trick and an assist, as KP got back on track, ending a five-game winless streak. Avery Snead and Chloe Layne each had a goal and two assists in the win. Jaida Caruso also scored off an assist from Jillian Anderson and Ally Stanton had one goal for KP. North Attleboro, 1 @ Stoughton, 1 – Final – Haley Nelson scored for Stoughton while Tara Nair scored for North Attleboro as the teams each took a point from the game. Canton, 47 @ Milford, 15 – Final – Milford swept the top five spots in the race on its way to a big win over the visiting Bulldogs. Milford’s Anthony DiStauro, Max Manor, and Brendan O’Shaughnessy were the top three runners, while Canton’s Kyle Downing took sixth overall as the top finisher for the Bulldogs. Top 10: 1. Anthony DiStauro (Mil, 16:46) 2. Max Manor (Mil, 16:59) 3. Brendan O’Shaughnessy (Mil, 17:10) 4. Gianni Panno (Mil, 17:21) 5. Chris Berthrong (Mil, 17:22) 6. Kyle Downing (Can, 17:32) 7. Miguel Torres (Mil, 17:32) 8. Alex Maddestra (Can, 17:35) 9. Gabriel Pardo Cota (Mil, 18:18) 10. Ryan Kelley (Mil, 18:26). Mansfield, 17 @ Taunton, 55 – Final – Mansfield took the first four spots in the race, with all four runners clocking in under 17 minutes, in a win over Taunton. Jason Windvogel was first overall with fellow Hornets Patrick Heavey, Mike Mullahy, and Paxton Howard crossing in a seven-second span. Taunton’s Nolan Tavares was the top Tiger, finishing fifth overall. Top 10: 1. Jason Windvogel (Mans, 16:50) 2. Patrick Heavey (Mans, 16:54) 3. Mike Mullahy (Mans, 16:55) 4. Paxton Howard (Mans, 16:57) 5. Nolan Tavares (Tau, 17:97) 6. Cullen Lancaster (Mans, 17:19) 7. Justin Miller (Mans, 17:31) 8. Ty Cali (Tau, 17:41) 9. Peter Sullivan (Mans, 18:01) 10. Sam Donnellan (Mans, 18:11). Stoughton, 50 @ Sharon, 15 – Final – Sharon swept the top five finishers on its way to a win over Stoughton, which clinched the outright Davenport division championship for the Eagles. The Eagles swept the entire top 10 with Jared Osofsky getting his first win of the season. Alex Starovoytov, Jacob Dubin, Jordan Saks, and Nathan Stockton rounded out the top five. Stoughton’s Colin Rahaman was the top runner for the Knights at 17:15. Top 10: 1. Jared Osofsky (Sha, 16:24) 2. Alex Starovoytov (Sha, 16:25) 3. Jacob Dubin (Sha, 16:25.1) 4. Jordan Saks (Sha, 16:25.2) 5. Nathan Stockton (Sha, 16:31) 6. Bradley Weiss (Sha, 16:34) 7. Noah Wieland (Sha, 16:45) 8. Mark Starovoytov (Sha, 16:46) 9. Kanishka Sethi (Sha, 16:53) 10. Tim Liu (Sha, 16:53.1). Franklin, 27 @ Attleboro, 37 – Final – Attleboro had the first two runners cross the finish line but Franklin swept 3-5 and clinched the win by getting seventh and eighth in the win. Julia Fenerty (19:41) was the top Panther, taking third, followed by Sydney Hawkins in fourth and Kat Walbert in fifth. Attleboro’s Shea Jamieson was first overall while Kelly Neuendorf took second. Top 10: 1. Shea Jamieson (Att, 18:59) 2. Kelly Neuendorf (Att, 19:07) 3. Julia Fenerty (Frank, 19:41) 4. Sydney Hawkins (Frank, 19:43) 5. Kat Walbert (Frank, 20:00) 6. Diana Blouin (Att, 20:19) 7. Mary Viera (Frank, 20:28) 8. Brandi Osborne (Frank, 20:34) 9. Steph Malachowski (Frank, 20:35) 10. Mackenzie Wildrick (Att, 20:36). Top 10: 1. Lexi Marcolini (Mil, 20:59) 2. Sara Comisky (Mil, 21:21) 3. Lillian Thibeault (Mil, 21:43) 7. Kate Donahue (Mil, 23:20) 8. Stephanie Goulet (Mil, 23:25). Mansfield, 22 @ Taunton, 33 – Final – Mansfield’s Margaret Riley and Tessa Lancaster took the top two spots and the supporting cast of Jessica Alestock, Brinly Meelia, and Emma Lamson all finished inside the top eight to secure the win and the Hockomock League Kelley-Rex division championship. For the first time this season, Riley crossed the finish line in under 20 minutes (19:56). Top 10: 1. Margaret Riley (Mans, 19:56) 2. Tessa Lancaster (Mans, 20:17) 3. Kailey Melito-Santos (Tau, 20:35) 4. Nia Mainer-Smith (20:49) 5. Jessica Alestock (Mans, 21:06) 6. Brinly Meelia (Mans, 21:07) 7. Olivia Weber (Tau, 21:09) 8. Emma Lamson (Mans) 9. Olivia Dias (Tau, 21:39) 10. Lily Icovic (Tau, 22:01). Stoughton, 44 @ Sharon, 17 – Final – The first four runners to cross the finish line were all from Sharon as the Eagles ran away with a win over visiting Stoughton. Eliana Boxerman took first place with Daphne Theiler, Juliana Dudziak, and Margaret Li all crossing just a second later. Stoughton’s Rebecca Lally took fifth overall, clocking in at 20:37. Top 10: 1. Eliana Boxerman (Sha, 20:27) 2. Daphne Theiler (Sha, 20:28.1) 3. Juliana Dudziak (Sha, 20:28.2) 4. Margaret Li (Sha, 20:28.3) 5. Rebecca Lally (Sto, 20:37) 6. Julia Franey (Sto, 21:20) 7. Ariella Levy (Sha, 21:38) 8. Berta Faktorovich (Sha, 21:39) 9. Kavya Anbarasu (Sha, 21:39.1) 10. Catherine Griffin (Sha, 21:39.2). Milford, 163 @ Canton, 158 – Final – Canton edged Milford by five strokes, earning a win and clinching the program’s second straight Davenport division title. Tommy Dimock was the match medalist with an impressive low-round of 33 to pace the Bulldogs. Thomas Singleton added a round of 38, Mike Gobbi shot 43, and Mike Leonetti chipped in with a 44. Justin Applebee and Alex Klosen each had a 40 for the Hawks, Riley Lynch added a round of 41 and Ed Madden finished with a 42. Foxboro, 172 @ Sharon, 169 – Final – Sharon defended its home course, beating the visiting Warriors by three strokes. Corey Carter led the way for the Eagles with a round of 37 while Andrew Glaser shot a 40. Noah Hicks shot 40 to lead Foxboro. Franklin, 158 @ Mansfield, 154 – Final – Mansfield pulled off its second straight upset, knocking off visiting Franklin. A day after beating Oliver Ames, the Hornets earned a four-stroke victory over the Panthers. A trio of sophomores – Jason See, Joseph Gormley, and Nate Morreale – all shot 38 to pace Mansfield while sophomore Brandon Kemp added a round of 40. King Philip, 160 @ North Attleboro, 163 – Final – King Philip earned a nice crossover win over North Attleboro on the middle course at Heather Hill Country Club. Kayla Schuberth had a low-round for the Warriors, shooting a 39 while Jack Hastry and Ian Nally each shot 40 and Nate Ihley added a 41. North Attleboro’s Jillian Barend was the match medalist with a 2-over par round of 37. Marcus Costa (40), Matt Wanless (42), and Pat Roberts (44) also scored for the Rocketeers. Oliver Ames, 147 @ Stoughton, 183 – Final – Oliver Ames’ top four golfers all had rounds of under 40 and the Tigers rolled to a big win at Easton Country Club. Nolan Donze led the way with a medalist round of 35, Liam Barry and Sam Becker each shot 37, and Brad Powers finished with a 38. Kyle Stone and Nick Szum each shot a 42 for the host Black Knights. North Attleboro, 4 @ Stoughton, 0 – Final – Click here for a photo gallery of this game. – North Attleboro found the back of the net three times in the first half and went on to add one more in the second half to beat Stoughton. Alex Pfeffer opened the scoring in the 7th minute, one-timing a cross from Andrew Tolfa. Five minutes later, Joe Hilf and Joey Coscarella combined at the top of the area, the latter converting his chance inside the box. Matt Mordini set up the third goal with great hustle, tracking down a ball right on the end line and finding Alvaro Martinez-Calvo at the far post. James Sales added a fourth goal on a rebound in the second half. Nolan Gerome had 21 saves in net for the Black Knights. Oliver Ames, 4 @ Taunton, 2 – Final – Oliver Ames outscored Taunton 3-1 in the second half to earn two points on the road. OA opened the scoring when Jimmy Keane found the back of the net on an assist from Brady deVos. Taunton tied the game just before the break to make it 1-1 heading into the second half. Niko Byron opened his account for the season to put OA ahead, finishing a service from Colin Milliken. Sean Flaherty (assisted by Kevin Louhis) put the visiting Tigers up 3-1 but Taunton cut the deficit to just one with 16 minutes to play. But Milliken iced the game, converting a penalty kick to make it 4-2. Attleboro, 4 @ Oliver Ames, 1 – Final – Attleboro scored three goals in the second half to pull away from the Tigers, avenging a shutout loss to the Tigers earlier this season. The Bombardiers led 1-0 at the break before OA tied it early in the second. Anna Beck, Hannah Webster, Emelia Westwater and Emma Briggs each scored once for Attleboro. Canton, 6 @ Stoughton, 1 – Final – Click here for a photo gallery of this game. Foxboro, 5 @ Milford, 0 – Final – Lily Daly and Sophia Lowe each scored twice as the Warriors pulled away from the Scarlet Hawks in the second half. Sophia DiCenso also scored for Foxboro, which led 1-0 at half. Mansfield, 0 @ Franklin, 5 – Final – Franklin set the tone early, scoring twice in the opening five minutes, in a big 5-0 win over Mansfield. Victoria Quinn had both of the first two goals, the first assisted by Amanda Lewandowski just 86 seconds into the contest. Quinn made it 2-0 on assists from Ashley Reutlinger and Regan Paterson just before the five minute mark. Lewandowski (from Reutlinger) made it 3-0 at the midway point of the first half. Paterson (from Lewandowski) made it 4-0 in the 36th minute and Quinn completed the hat trick with an unassisted tally in the 39th minute. Christina Luccini made nine saves for the shutout and FHS head coach Michelle Hess said Maeve Ledwith had a fantastic game defensively and Cassi Ronan had a great game controlling the field from the center mid position. King Philip, 4 @ Taunton, 0 – Final – King Philip scored a pair of goals in each half to earn a shutout win on the road at Taunton. Claire Lawler scored both of KP’s first half tallies, both off assists from Alli Meehan, Lawler opened the scoring in the 7th minute and then made it 2-0 in the 10th minute. Cristina Gifun (assisted by Meehan) struck less than five minutes into the second half to make it 3-0 and Meehan capped the scoring in the 46th minute, converting a pass from Nicole Connor. Attleboro, 0 @ Oliver Ames, 3 – Final – Oliver Ames senior Sadie Homer recorded her 1,000th career dig as the Tigers rolled to a win at home (25-16, 25-19, 25-10). Homer, who had 37 digs, is just the second player in program history to reach the 1,000-point club. Caitlin Cavanaugh had 12 kills, Jordan Bosse added 10 kills, and Grace McCallum chipped in with six aces for OA. Attleboro’s Amanda Kadisveskis had five kills, three blocks, and an ace, Chelsea Calgagni finished with 11 kills and six digs, and Jessica Matheson had 13 digs for the Bombardiers. Canton, 3 @ Stoughton, 2 – Final – Click here for a recap and photo gallery of this game. Foxboro, 1 @ Milford, 3 – Final – Click here for a photo gallery of this game. Mansfield, 1 @ Franklin, 3 – Final – Mansfield became just the third team to take a set against the Panthers this year, winning the second set to make it 1-1 but Franklin notched convincing wins in the next two sets to get the win (25-19, 23-25, 25-14, 25-13). For the Hornets, Greenly Kelly had nine kills and eight service points, Sam Sternberg had eight digs and eight service points, and Ashley Santos chipped in with five kills. King Philip, 3 @ Taunton, 1 – Final – Taunton won a tight second set but King Philip didn’t let the momentum swing to the home team, taking the match 3-1 (25-18, 25-27, 25-10, 25-13). For the Warriors, Catherine Waldeck had 15 kills and a block, Nicole Coughlan added seven kills and two blocks, Shayla Weitzman finished with eight digs and two aces. Sharon, 1 @ North Attleboro, 3 – Final – After splitting the first two sets, North Attleboro earned the win by taking the next two sets against Sharon (25-10, 21-25, 25-14, 25-20). Hayley Gaskin set the offense in motion with 40 assists while Tatiana Sotelo had a career-high 22 kills for the Rocketeers. Franklin, 162 @ Stoughton, 187 – Final – Franklin was led by medalist Quentin Faro, who carded a low-round of 37. Matt D’Errico added a 39 for Franklin, and Gerard Collins and Jake Peterson each shot a 43. Stoughton was led by Josh Hough win a 42. Sharon, 175 @ Stoughton, 187 – Final – Sharon’s Corey Carter earned medalist honors, shooting a 37 to pace the Eagles to a win over Stoughton at Easton Country Club. Max Brody added a 42 for the Eagles and Nathan Daley carded a round of 45. Josh Hough led the Black Knights with a round of 42. Oliver Ames, 158 @ Mansfield, 154 – Final – Mansfield earned its biggest win of the season by upsetting visiting Oliver Ames. OA’s Nolan Donze had a medalist round of 35 but Mansfield got contributions from Nate Morreale (36), Jason See (37), Joseph Gormley (40) and Ryan Dow (41) to get the win. Thomas Walsh added a round of 39 for the Tigers and Tate Hadges and Sam Becker each shot a 42. Milford, 173 @ Mansfield, 154 – Final – Nate Morreale carded a round of 36 and Jason See shot a 37 to pace the Hornets to a win over visiting Milford. Joseph Gormley added a round of 40 while Ryan Dow chipped in with a 41. Oliver Ames, 2 @ Canton, 2 – Final – Canton scored a pair of goals in the opening 10 minutes but Oliver Ames responded with a pair of second half goals to earn a point on the road. Senior Griffin Roach scored a pair of early goals to put the hosts ahead, a lead that Canton took into halftime. But Oliver Ames struck for a pair of goals inside a five minute span to level the scoring. Sophomore Kevin Louhis brought the visitors within one on an assist from sophomore Colin Milliken in the 59th minute, and two minutes later, Milliken tied the game off a feed from Haendel Louhis. Taunton, 1 @ Stoughton, 1 – Final – Stoughton junior Mason Eschleman scored his first career goal in the final five minutes to hepl the Black Knights earn a point against visiting Taunton. Eschleman finished off a centering pass from John Ortiz with just three minutes to play to bring Stoughton level. Taunton took the lead in the 10th minute when Mateusz Hagemajer converted a pass from Dylan Kullas. Stoughton sophomore Nolan Gerome made 22 saves in net while Taunton keeper Nolan Melo made 13 stops. Canton, 0 @ Oliver Ames, 1 – Final – Oliver Ames used a first half goal to earn a 1-0 win over visiting Canton, clinching a spot in the state tournament. Daniella Ferrini scored off a rebound of Erin Holmberg’s shot to put the Tigers ahead. Emma O’Donnell recorded the shutout in net for Oliver Ames. Stoughton, 1 @ Taunton, 2 – Final – Alex Wapenski scored a pair of goals to help the Tigers edge Stoughton. Stoughton’s goal was scored by Cintia Khouzami, assisted by Mackenzie Manning. Nicole Weir and Nikki Anderson both had strong games on defense for the Knights. Attleboro, 6 @ Milford, 0 – Final – Attleboro went on the road and recorded a convincing victory, beating Milford 6-0. Alex Compton paced the Bombardiers’ offense, netting a hat trick while Anna Beck, Hannah Webster, and Takara Keele each scored once in the win. Oliver Ames, 0 @ Canton, 1 – Final – Click here for a photo gallery from the game – Maggie Connolly followed up a Meg Aldrich shot that OA goalie Kara Ostrander saved and knocked in the rebound to lift Canton to the victory. The Bulldogs created a number of chances to try and put the game away in the second half but Ostrander made a series of saves to keep the Tigers in it. Sophomore Riley O’Connor earned the shutout for Canton. King Philip, 0 @ Foxboro, 1 – Final – Foxboro senior Sophia Lowe scored late in the first half as the host Warriors handed King Philip its first loss of the season. Lowe converted with 4:15 left in the first half to give Foxboro the lead. King Philip had over 20 shots on goal but Foxboro keeper Julia Carangelo had a strong game, recording the shutout. Franklin, 7 @ Sharon, 0 – Final – Franklin raced out to a 4-0 lead at halftime and never looked back in a win against Sharon. Cassi Ronan and Stephanie Bell each scored a pair of goals to pace the Panthers’ offense, Amanda Lewandowski and Victoria Quinn each had a goal and an assist in the win, and Olivia Rondeau (first career goal) and Katie O’Rourke (assist) each had one point apiece. Taunton, 2 @ Stoughton, 0 – Final – After the majority of the game went without any scoring, Taunton tacked on two goals late in the second half to grab two points on the road in a win over Stoughton. Kathryn Robinson (assisted by Jillian Pagliuca) and Cierra Bartel (assisted by Kennedy Thielker) each scored once for the Tigers. Oliver Ames, 0 @ Canton, 3 – Final – Canton defended home court with a 3-0 sweep (25-17, 25-15, 25-17) of visiting Oliver Ames. Taylor Harris had eight kills, one block, and 13 digs, Olivia Chinsen had a solid night with two aces, three kills, and 10 digs, and Erin Devine and Bailey Shea both had solid games at the net, combining for seven blocks and eight kills. Nicole Brown continued to run the court with 17 assists and five kills for the Bulldogs. Oliver Ames’ Jordan Bosse had 12 kills, eight digs and three aces, Sadie Homer finished with 32 dig, and Allie Kemp added 24 assists. King Philip, 3 @ Foxboro, 0 – Final – King Philip’s Catherine Waldeck and Nicole Coughlan had strong performances at the net while Jessie Kornfeld and Kristen Masse were strong at the service line, helping the visiting Warriors knock off Foxboro (25-15, 25-5, 25-22). Coughlan had a team-high 12 kills while Waldeck added nine to pace the offense. Kornfeld finished with 10 service points, including four aces while Masse had 11 service points, one ace, and three kills. Mansfield, 2 @ North Attleboro, 3 – Final – After splitting the first four sets, North Attleboro earned the win with a 15-5 win in the fifth set, taking the match 3-2 (25-19, 19-25, 25-21, 23-25, 15-5). For Mansfield, Greenly Kelly had 11 kills and three blocks and Sam Sternberg added 19 digs and 15 service points. Taunton, 0 @ Stoughton, 3 – Final – Stoughton swept Taunton (25-22, 25-23, 25-16) in a close match, earning its ninth win of the season and clinching a spot in the state tournament. The Black Knights got contributions from the entire line up with Amaya Morris having a strong two-way game, recording six kills and five blocks. Attleboro, 30 @ Taunton, 25 – Final – Top 10: 1. Nolan Tavares (Tau, 17:37) 3. Ty Cali (Tau, 18:01) 4. Colin Quinlan (Tau, 18:23) 7. Cameron Parker (Tau, 18:31) 10. Ryan Strawbridge (Tau, 19:04). Sharon, 19 @ Foxboro, 43 – Final – Sharon’s Alex Starovoytov edged Foxboro’s Ryan Proulx for first place, and the Eagles had six of the top seven finishes in a big win over the Warriors. Starovoytov beat Proulx by just one second, both runners nearly a minute ahead of the rest of the pack. Sharon’s Jacob Dubin rounded out the top three. Top 10: 1. Alex Starovoytov (Sha, 17:22) 2. Ryan Proulx (Fox, 17:23) 3. Jacob Dubin (Sha, 18:21) 4. Jordan Saks (Sha, 18:22) 5. Bradley Weiss (Sha, 18:37) 6. Nathan Stockton (Sha, 18:41) 7. T. Liu (Sha, 18:52) 8. Trey Lawson (Fox, 18:56) 9. N. Wieland (Sha, 19:11) 10. Mark Starovoytov (Sha, 19:32). King Philip, 35 @ Mansfield, 25 – Final – King Philip had the top two runners in the race but Mansfield had the next six, helping the Hornets pick up the win. KP’s Mike Griffin won the race, over 20 seconds ahead of the rest of the pack. KP’s Mike Nordberg was second overall while Jason Windvogel, Patrick Heavey, and Paxton Howard were Mansfield’s top three runners. Top 10: 1. Mike Griffin (KP, 16:42) 2. Mike Nordberg (KP, 17:05) 3. Jason Windvogel (Mans, 17:13) 4. Patrick Heavey (Mans, 17:26) 5. Paxton Howard (Mans, 17:31) 6. Mike Mullahy (Mans, 17:35) 7. Cullen Lancaster (Mans, 17:52) 8. Justin Miller (Mans, 18:07) 9. Eric DeLorenzo (KP, 18:10) 10. Peter Sullivan (Mans, 18:24). Sharon, 31 @ Foxboro, 24 – Final – Foxboro’s trio of Abby Hassman, Lexi Quinn, and Lindsey Nelson continued to dominate, taking the top three spots in the race to lead the Warriors to a close win over Sharon. Sharon had the next four runners cross the finish line but Jill Finn’s eighth place finish help secure the win. Franklin, 25 @ Oliver Ames, 34 – Final – Oliver Ames had the top two runners cross the finish line but Franklin had the next five, resulting in a close win over the Tigers. OA’s Meghan Reardon and Catherine O’Donnell crossed together but Franklin’s Julia Fenerty, Sydney Hawkins, and Kat Walbert all crossed within a minute, and Sarah Giulino and Julia DiGiacomo came across less than a minute later to help secure the win for the Panthers. Top 10: 1. Meghan Reardon (OA, 20:51) 2. Catherine O’Donnell (OA, 20:51) 3. Julia Fenerty (Frank, 21:12) 4. Sydney Hawkins (Frank, 21:20) 5. Kat Walbert (Frank, 21:40) 6. Sarah Giuliano (Frank, 22:27) 7. Julia DiGiacomo (Frank, 22:28) 8. Julia Sarro (OA, 22:29) 9. Brandi Osborne (Frank, 22:48) 10. Erin Barry (Frank, 22:50). King Philip, 33 @ Mansfield, 22 – Final – Mansfield’s Tessa Lancaster and Maggie Riley continued to shine, taking the top two spots in the race, while Jessica Alestock and Brinly Meelia took fifth and sixth, respectively, to help the Hornets clinch the win. After splitting the top four spots, with KP taking third and fourth, the race came down to the next two spots, which Mansfield took both of. Top 10: 1. Tessa Lancaster (Mans, 20:31) 2. Maggie Riley (Mans, 20:38) 3. Maya Evans (KP, 20:50) 4. Ryenn Hart (KP, 21:50) 5. Jessica Alestock (Mans, 22:14) 6. Brinly Meelia (Mans, 22:19) 7. Isabelle Crocker (KP, 22:52) 8. Emma Lamson (Mans, 22:57) 9. Abigail Simmons (KP, 23:03) 10. Abigail Dunne (KP, 23:19). Milford, 24 @ Stoughton, 31 – Final – Stoughton had the top runner but Milford’s depth proved to be the difference. Milford’s Sara Comisky, Lillian Thibeault, and Lexi Marcolini finished second, third, and fourth overall, respectively, and senior Kate Donahue grabbed seventh overall to secure the win for the Scarlet Hawks. Top 10: 1. Sydnee Hyacinthe (Sto, 22:58) 2. Sara Comisky (Mil, 23:07) 3. Lillian Thibeault (Mil, 23:24) 4. Lexi Marcolini (Mil, 23:40) 5. Rebecca Lally (Sto, 24:42) 6. Julia Franey (Sto, 25:17) 7. Katerina Donahue (Mil, 25:56) 8. Stephanie Goulet (Mil, 26:37) 9. Theresa Billo (Sto, 27:20) 10. Heather Maddalena (Sto, 27:29). Sharon, 154 @ Canton, 149 – Final – Canton picked up an important win over division rival Sharon with junior Chris Lavoie leading the way. Lavoie carded a team-low round of 34 to pace the Bulldogs. Tommy Dimock (37) and Thomas Singleton (38) both had sub-40 rounds while Conor Hunter carded an even 40 for Canton. Sharon’s Corey Carter had one of the best rounds of any Hock golfers this season, earning match medalist honors with a 33. Ethan Skelly was also impressive, shooting a 34 for the Eagles. Foxboro, 177 @ Franklin, 166 – Final – Franklin’s Matt D’Errico earned match medalist honors after shooting a 40. Jack Paterson (41), Jake Blaney (42), and Gerard Collins (43) all scored for the Panthers while junior Matt Lathrop led the Warriors with a 41. Mansfield, 158 @ Stoughton, 179 – Final – Mansfield sophomore Jason See carded a round of 38 to earn match medalist honors and pace the Hornets to a win on the road against Stoughton. Ryan Dow, Ava Haggis and Joe Gormley all chipped in with a 40 for Mansfield. Stoughton was led by Luke Bainton with a 40 and Josh Hough with a 43. Oliver Ames, 160 @ Taunton, 191 – Final – Oliver Ames senior Nolan Donze shot a 2-under par round of 34 to lead the Tigers to a win. Ryan Bock added a 40, Tate Hadges finished with a 42, and Brad Powers added a 44 for the Tigers. Franklin, 3 @ Attleboro, 1 – Final – Franklin senior Tim Duval scored a pair of goals and assisted on another to lead the Panthers to a win on the road. “It was a well played game, our kids played really well together tonight,” said Franklin head coach Fran Bositis. Junior Lucas Moura set Duval up for his first goal, and Duval assisted on classmate Ethan Bowen’s goal. Milford, 2 @ Canton, 1 – Final – Milford junior Walisson de Oliveira opened the scoring in the first half and assisted on what proved to be the game-winner in the second as the Hawks picked up a key win on the road to pull into a first place tie in the Davenport division. de Oliveira capitalized on a loose ball behind the defense, chipping the keeper in the 15th minute to put the Hawks up 1-0. In the 71st minute, de Oliveira flicked himself in, got a touch past the keeper and Joao Vitor Neiva slid and pushed the ball across the line. Canton struck just two minutes later when Paolo Ruggeri converted a nice shot from outside the area to cut the deficit in half. Foxboro, 1 @ North Attleboro, 2 – Final – Click here for a recap and photo gallery from this game. King Philip, 0 @ Oliver Ames, 1 – Final – In a back-and-forth contest, Oliver Ames scored the game-winning goal inside the final 10 minutes to grab two points at home, bouncing back from its first loss of the season. Senior Sean Flaherty found the back of the net after Haendal Louhis flicked on a throw in from Harry Ahearn. Senior Jacob Lerman and Drew Nikla combined for the shutout for the Tigers, each making a big stop. Lerman thwarted a breakaway in the first half while Nickla came up with a big save without allowing a rebound on a cross in the final minutes. Mansfield, 7 @ Taunton, 0 – Final – Mansfield raced out to a 5-0 lead by halftime and never looked back, beating Taunton to qualify for the state tournament. Junior Raffi Marzella scored a pair of goals in the win while classmate Robert Healey had two assists. Junior Colin Caridi, freshman Dylan Buchanon, and senior Ethan Brill-Cass each had a goal and an assist. Stoughton, 0 @ Sharon, 3 – Final – Sharon broke into the win column with a 3-0 decision over visiting Stoughton. Bryce Nathan had the game-winning goal and also recorded an assist for the Eagles. Nathan opened the scoring in the 25th minute, converting an assist from Antonio El-Khoury. Sharon made it 2-0 before the break when Brian Higgins took a feed from Andrew Ableman and found the back of the net. Nathan set up Victor Schneider for a goal in the second half. Stoughton sophomore Nolan Gerome made 16 saves for the Black Knights. Attleboro, 0 @ Franklin, 3 – Final – Franklin scored three times in the final 20 minutes to secure a win in a physical division game. Sabrina Addi opened the scoring for the Panthers and Franklin took advantage of the Bombardiers pushing forward after an equalizer to score two more. Hailey Toolin added the second off an assist from Sydney St. Marie and Anna Blakus sealed the win in the final minute off an assist from Calen Frongillo. Tayla Drape made 10 saves for Attleboro, while Breanna Atwood made four to keep a clean sheet. Milford, 0 @ Canton, 4 – Final – Click here for a photo gallery from this game. – Canton sophomore scored a pair of goals and had an assist as the Bulldogs notched a convincing win at home. Gilmore scored twice in the first half, both off of restarts. In the sixth minute, Gilmore scored an olimpico – a goal straight from a corner kick. Just 10 minutes later, she floated a free kick from 30 yards out on the left sideline into the far post for a 2-0 lead. In the second half, Gilmore set up Elisa Diletizia, who made a nice move to get free and slotted a low shot into the corner in the 42nd minute. Five minutes later, Lauren McCabe’s cross found Olivia Rodman at the back post and she blasted a shot just under the bar to make it 4-0. North Attleboro, 1 @ Foxboro, 2 – Final – Katelyn Mollica scored once and assisted on the second goal for the Warriors, who jumped out to a 2-0 lead by halftime. The first goal came straight from a corner and the second came off a Mollica free kick that was headed home by Jordyn Collins. Alex Moulson scored her first career goal to cut the lead in half with eight minutes left off an Ashlyn Gaulin assist, but the Warriors held on for the win to keep hold of first in the Davenport division. Foxboro coach Katie Stalcup said that the defense and goalie Morgan Sylvestre had great games in the win. Taunton, 0 @ Mansfield, 5 – Final – Melissa Reef scored what turned out to be the game-winner for the Hornets and her midfield partner Bryn Anderson had a goal and two assists. Maria Sevastos added a goal and an assist, Steph Kemp had an assist, and Katie Miller scored her first career goal for the Hornets. Defender Emily Vigeant also got on the scoresheet off a Katy Garvin assist. Izzy Anslow made 12 saves for the Tigers. Oliver Ames, 2 @ King Philip, 1 – Final – Oliver Ames battled back from a goal down with a pair of second half goals to pull out the road win. Anna Tempestoso tied the game from the penalty spot and in the final minute Brianna Gibson added an “olimpico” to secure the full two points for the Tigers. Sharon, 0 @ Stoughton, 0 – Final – Brianna Buckley earned her first clean sheet of the season for the Black Knights. Stoughton, 3 vs. East Bridgewater, 0 – Final – Stoughton earned a season sweep over East Bridgewater, beating the Vikings 3-0 for the second time this season. Allie Howe paced the Knights’ offense with two goals while Alanna McCormick had the other goal. Franklin, 3 @ Attleboro, 0 – Final – Franklin recorded a win o the road, knocking off Attleboro 3-0 (25-10, 25-9, 25-11). FOr Attleboro, Jessica Matheson had eight digs and Chelsea Calcagni added six kills. Mansfield, 149 @ Oliver Ames, 148 – Final – Oliver Ames’ Nolan Donze and Steve Heino both had strong outings, leading the Tigers to a one-stroke win over Mansfield. As the final pair, Donze carded a round of 36 while Heino shot 37. Thomas Walsh also added a 37 and Tate Hadges shot a 38 for Oliver Ames. Mansfield’s Jason See was the match medalist with nine pars, shooting a low-round of 34. Sharon, 177 @ Foxboro, 169 – Final – Foxboro’s Noah Hicks earned match medalist honors with a low round of 40, helping the Warriors pick up a key division win over Sharon. Dylan Quinn added a 42 for the Warriors while Matt Hague (43) and Matt Lathrop (44) also scored for Foxboro. Sharon’s Max Brody had a team-low round of 42. Stoughton, 169 @ North Attleboro, 150 – Final – North Attleboro had three golfers break 40 in a win over visiting Stoughton. Matt Wanless was the match medalist, shooting a 36 to pace the Rocketeers. Jillian Barend and Pat Roberts each shot 37 while Marcus Costa contributed with a 40. Max Huminik led the Black Knights with a 39. Stoughton, 169 vs. Milford, 163 – Final – The Black Knights participated in a tri-match, facing off with both North Attleboro and Milford. Riley Lynch was the medalist for the Hawks with a 38 while Max Huminik led Stoughton with a 39. Luke Bainton and Kyle Stone each for 43 for Stoughton and Josh Hough carded a 44. Sharon, 0 @ Attleboro, 5 – Final – Attleboro built a 4-0 advantage at halftime and never looked back in a win over the visiting Eagles. Anna Beck led the offensive charge, netting three goals while Amanda Burns and Genevieve Takian each found the back of the net once for the Bombardiers. Canton, 3 @ Taunton, 2 – Final – Taunton took a 1-0 lead into half and had a 2-1 lead in the second half but Canton scored two straight goals to grab two points on the road. Caitlin Connors gave the Tigers the lead on an assist from Rosemary McGrath. After Canton tied it, Alana Tavares put Taunton back in front on an assist from Hannah Blackwell. Emma Sheehan had 10 saves in net for Taunton. Foxboro, 1 @ Franklin, 1 – Final – Franklin’s Ashley Reutlinger scored at 1:11 of the second half to help the Panthers earn a tie against Foxboro. Reutlinger’s goal was assisted by Regan Paterson. Christina Luccini made 10 saves in net and Marissa Canesi had a strong game defensively for the Panthers. North Attleboro, 1 @ King Philip, 7 – Final – King Philip’s Claire Lawler and Alli Meehan each had three points as the Warriors rolled to a big win at home. Meehan scored a hat trick while Lawler scored once and had two assists. Kate Lindmark also had multiple points, notching two assists while Meghan MacDonald (assist), Dana Truini (assist), and Nicole Connor (goal) each had one point. Sharon, 2 @ Attleboro, 3 – Final – Click here for a Photo Gallery from this game. After a back and forth contest, Attleboro broke into the win column with a 3-2 (25-23, 19-25, 25-22, 11-25, 15-11) decision over Sharon. Ana Leonardo paced the offense with 15 assists and four kills, Amanda Kadeseveski had five blocks, four kills, and two aces, and Chelsea Calcagni had 10 kills, six aces, three digs, and a block for the Bombardiers. Canton, 3 @ Taunton, 0 – Final – Canton went on the road and earned a 3-0 sweep (25-14, 25-23, 25-16) over host Taunton. For Canton, Taylor Harris had 11 kills, two aces, and 12 digs, Erin Devine added six kills and three blocks, Nicole Brown had 14 assists, 11 digs and five kills, and Megan McDonough held the defense together and tallied 20 digs. For Taunton, Kamila Cuevas had a strong game at the net with nine kills and Hailey Sullivan made her presence felt in the back row, with 26 passes and six digs. Foxboro, 0 @ Franklin, 3 – Final – Franklin improved to 10-0 overall this season with a 3-0 win over Foxboro (25-12, 25-13, 25-16). Ellie Wisniewski (five aces) and Peyton Arone (two aces) paced the offense with seven kills apiece, Riley Marino had 13 digs, and Lauren McGrath continued to have a strong season with 27 assists. North Attleboro, 0 @ King Philip, 3 – Final – King Philip defended home court with a 3-0 win (25-23, 25-12, 25-21) over visiting North Attleboro. The Warriors were led by the strong attacking trio of Nicole Coughlan (11 kills, 11 service points), Catherine Waldeck (eight kills, three blocks), and Kristen Masse (five kills). Milford, 0 @ Oliver Ames, 3 – Final – Oliver Ames fended off visiting Milford to earn a 3-0 sweep (25-16, 25-15, 25-23). Jordan Bosse had a strong game for the Tigers, recording 13 kills, 10 digs, and two aces. Sadie Homer added 28 digs and Allie Kemp finished with 25 assists for the Tigers. Stoughton, 3 @ Mansfield, 1 – Final – Stoughton picked up its seventh win of the season, earning a 3-1 (25-20, 25-15, 24-26, 25-16) over Mansfield. Molly Turner led the way for the Black Knights, recording 21 service points including eight aces, 13 kills and 18 digs. Hanna Holden and Mia Bennett were strong on defense, combining for 42 digs in the win. For Mansfield, Greenly Kelly had 11 kills and eight service points while Katie Dardinski and Abby Sullivan each had eight service points. Attleboro, 172 @ Mansfield, 158 – Final – Mansfield sophomore Ava Haggis was the match medalist, shooting a 38 to pace the Hornets to a win at Norton Country Club. Sophomores Nate Morreale, Ryan Dow, and Jason See each shot a 40 for the Hornets. Attleboro’s Ethan Johnson had a team-low round of 40 while Ben Wood carded a 42. Canton, 161 @ Sharon, 153 – Final – Sharon senior Corey Carter and sophomore Ethan Skelly each shot 2-under par to pace the Eagles to a key division win over Canton. Carter and Skelly each shot 34, senior Max Brody carded a 41 and senior Sam Fergenbaum finished at 44. Canton’s Chris Lavoie had a team-low round of 38, Tommy Dimock and Mike Leonetti each shot 40, and Ryan Nolte added a round of 43 for the Bulldogs. Taunton, 189 @ Franklin, 167 – Final – Matt D’Errico earned match medalist honors as the Panthers notched a win at Franklin Country Club. D’Errico shot a round of 40 to pace the Panthers while Gerard Collins chipped in with a 42 for Franklin. North Attleboro, 161 @ Oliver Ames, 150 – Final – Oliver Ames defended its home course with a win over visiting North Attleboro. Nolan Donze and Thomas Walsh shared team medalist honors, each finishing with a round of 37 to lead the Tigers. Steve Heino and Ryan Bock each shot 38 in OA’s win. Matt Wanless earned match medalist honors, leading the Rocketeers with a 35. Taunton, 35 @ Franklin, 20 – Final – Franklin senior Julia Fenerty earned her first career cross country win and the Panthers swept the top three spots in a win over Taunton. Fenerty crossed in 19:21 while Kat Walbert and Sydney Hawkins took second and third, respectively, for the Panthers. Taunton’s Kailey Melito-Santos was the top finisher for the Tigers, taking fourth overall. Top 10: 1. Julia Fenerty (Frank, 19:21) 2. Kat Walbert (Frank, 19:25) 3. Sydney Hawkins (Frank, 19:37) 4. Kailey Melito-Santos (Tau, 19:59) 5. Sarah Giuliano (Frank, 20:02) 6. Lily Valcovic (Tau, 20:15) 7. Olivia Weber (Tau, 20:15) 8. Olivia Dias (Tau, 20:16) 9. Mary Viera (Frank, 20:17) 10. Nia Mainer-Smith (Tau, 20:43). Sharon, 1 @ Attleboro, 2 – Final – Sharon took the lead early in the second half but Attleboro tied it quickly and found the game-winner late. After the Eagles went up in the 45th minute, the Bombardiers quickly leveled in the 47th minute when Mike Russo scored on a breakaway on a pass from Aidan Lancaster. Eli Araujo scored the game-winner, heading in a pass from Will Halben, to give the Bombardiers two points. Canton, 6 @ Taunton, 2 – Final – Canton senior Griffin Roach scored a first half hat trick as the Bulldogs rolled to a big win on the road at halftime. Canton built a 4-0 advantage after 40 minutes of work, and then both sides found the back of the net twice in the second half. Roach also had two assists while Paul Corcoran (goal, assist), TJ McCabe (goal assist), Colby Ciffolillo (goal), and Paolo Ruggeri (two assists) all found the scoresheet for Canton. North Attleboro, 2 @ King Philip, 0 – Final – North Attleboro scored once in each half while keeper Kyle Briere came up big on a pair of corner kicks as the Rocketeers blanked King Philip. Alessandro Gioria scored his first varsity goal on an assist from Alex Pfeffer, giving Big Red a 1-0 lead in the 31st minute. Late in the game, Alvaro Calvo iced the game, scoring in the 75th minute on an assist from Joe Hilf. Briere (eight saves) had his seventh shutout of the season. Stoughton, 0 @ Mansfield, 6 – Final – Stoughton sophomore goalie Nolan Gerome had a spectacular first half, keeping the Hornets scoreless for the opening 40 minutes. But Mansfield’s offense finally broke through early in the second half on its way to a 6-0 win. Luke Savoie scored a second half hat trick (46th, 52nd, and 57th minute) with Luke Devine and Dylan Buchanan earning assists. Senior Ethan Brill-Cass (from Peter Oldow), Raffi Marzella (from Evan Eames), and Sam Nugent (unassisted) each scored in the second half as well. Milford, 5 @ Oliver Ames, 0 – Final – Click here for a recap of this game. Attleboro, 3 @ Sharon, 1 – Final – Maxine Gordon scored the Sharon goal. King Philip, 0 @ North Attleboro, 1 – Final – The North Attleboro defense put in a great performance to hold the league’s top attack off the board on Monday. North coach Bill Wallace praised Liz Smahi, Lydia Hershey, Morgan Silver, Olivia Bishop, Sam Hawkins and Brie Westcott for their “smothering defense.” Goalie Emma Noreck kept the clean sheet, including a pair of great saves in the first half. Ashlyn Gaulin scored the game’s only goal late in the opening half off a Haley Ferrin assist and the defense made the goal hold up over the final 40 minutes. Mansfield @ Stoughton – Postponed to day/time TBD. Oliver Ames, 5 @ Milford, 1 – Final – Gabi McLaughlin scored a pair of goals to lead the Tigers to a divisional crossover win. Erin Holmberg, Lauren Sellmayer, and Lauren Picanzi also scored goals for OA, while Cassie Probert had the Milford goal. Brianna Gibson had three assists for the Tigers. Attleboro, 2 @ Taunton, 3 – Final – Jillian Pagliuca scored the game-winner for the Tigers with 13 minutes remaining in the game. The winning goal was assisted by Alana Tavares. Cierra Bartel and Lauren Torres also scored for Taunton, while Anna Beck and Alex Compton had the Attleboro goals. Taunton coach Liz Hathaway said that Jocelyn Pagliuca and Kathryn Robinson also played well defensively in the win. Franklin, 4 @ Oliver Ames, 3 – Final – Hannah Stryke opened the scoring with 10 minutes left in the first, but Franklin scored four times over the next half hour to get control. Sarah Carney tied the game for Franklin and Victoria Quinn scored twice (both assisted by Cassi Ronan) to give Franklin a 3-1 lead. Ronan then scored unassisted in the second half to extend the advantage to 4-1. The Tigers answered back with two goals in two minutes, one by Stryke (assisted by Kayla Lozzi) and the second by Maggie Woods (assisted by Emily Dionne) to cut the lead to just one. OA kept pressuring and had several chances to tie it but the Panthers held on for the win. OA coach Sharon Lawrence praise Lozzi for her overall performance. Franklin goalie Anna Jardine made four saves in the win. Milford @ Stoughton – Postponed to day/time TBD. King Philip, 4 @ Mansfield, 4 – Final – The Hornets nearly made it three straight wins against King Philip (after handing the Warriors their only two losses last year), but Alli Meehan’s second goal of the game (assisted by Nicole Connor) tied the game and kept KP unbeaten this season. Lauren Craig scored the first Mansfield goal off an assist by Hayleigh Crawford. Alicia Hottleman scored the next three for the Hornets, one assisted by Maggie Danehy and the other two by Becca Hottleman. Meehan scored twice and assisted on two others for KP. Meghan MacDonald and Claire Lawlor had the other two goals for the Warriors. Attleboro, 0 @ Taunton, 3 – Final – Taunton defended its home court with a 3-0 sweep (25-21, 25-12, 25-11) over visiting Attleboro. Sam Silviera had 13 kills while Mckenzie Lucie had a strong game in the back row, recording six digs, four aces, and 22 service points. Jaime Brown also had a strong game for the Tigers with 25 assists, three digs, and two aces. North Attleboro, 0 @ Canton, 3 – Final – Canton won 25-11, 25-22, 25-14 and head coach Pat Cawley said that the entire team contributed to the win. Nicole Brown had another solid all-around game with 16 assists, 10 digs, an ace, and a kill for the Bulldogs. Megan McDonough had 12 digs and Taylor Harris and Erin Devine each had eight kills and two blocks. Franklin, 3 @ Oliver Ames, 1 – Final – OA won the opening set, but Franklin won the final three sets to stay unbeaten. The Panthers won 17-25, 25-19, 25-18, 25-15. Sadie Homer set a career-high with 40 digs for OA, while Allie Kemp had 31 assists. The Tigers also got 14 kills from Jordan Bosse and seven kills and three aces from Jackie Raymond. King Philip, 2 @ Mansfield, 3 – Final – Mansfield raced out to a 2-0 lead only for King Philip to storm back, winning the third set big and then edging the Hornets in a close fourth set. But the Hornets were able to close the win, earning a 16-14 win in the fifth set to get the victory (25-19, 25-17, 11-25, 24-26, 16-14). For Mansfield, Greenly Kelly had 10 kills, 10 service points, and five blocks, Olivia McGrath added 12 kills, Emily Dardinski chipped in with 11 kills, and Katie Dardinski finished with 11 service points and six digs. Catherine Waldeck led KP with 15 kills two blocks and Nicole Coughlan had a strong game, finishing with 14 kills, seven blocks, and two aces. Milford, 2 @ Stoughton, 3 – Final – Milford rallied from a 2-0 deficit to force a fifth set but Stoughton held on to defeat the Hawks. For Stoughton, Sasha Hyacinthe had a strong game behind the line with 19 service points, Molly Turner and Mia Bennett combined for 40 digs, and Delaney Nagel and Hanna Holden each had seven kills to pace the Knights. Mansfield, 164 vs. Norton, 158 – Final – Mansfield’s Jason See was the team medalist, carding a team-low round of 38 but the Hornets fell at Norton Country Club. Oliver Ames, 150 @ Milford, 171 – Final – Thomas Walsh led the way again for OA, shooting a medalist round of 35. Liam Barry and Tate Hadges both shot a round of 38 and Nolan Donze carded a 39 for the Tigers. Sharon @ Stoughton – Postponed to day/time TBD. Attleboro, 2 @ King Philip, 4 – Final – King Philip scored three goals in the first half, overcoming a one-goal deficit, to beat Attleboro. The Warriors opened the scoring in the third minute when sophomore Ajae Olsen converted a feed from classmate Camron Lawrence. Attleboro struck back for a pair of goals to seize a 2-1 lead as Hugo Henriquez struck in the 11th minute (from Josh Smith) and Will Halben scored in the 29th minute. But KP responded quickly as Ian Zimmerman (from Gavon Fox) made it 2-2 in the 34th minute. Just before halftime, senior Tony Bozza put the hosts ahead, 3-2, in the 38th minute. Bozza added an insurance goal midway through the second off an assist from freshman Stephen Griffin. Canton, 1 @ Sharon, 0 – Final – Canton’s Simon Cruz with just under 10 minutes to play to give the Bulldogs two points on the road. Foxboro, 7 @ Stoughton, 0 – Final – Foxboro junior Dylan Barreira exploded for six goals in the first half to pace the Warriors to a win. Nic Beigel scored the other goal for the Warriors while also recording four assists in the victory. Stoughton sophomore Nolan Gerome made his varsity debut in net, recording 19 saves for the Black Knights. Taunton, 3 @ Franklin, 0 – Final – Taunton exploded for three goals in the second half to pick up its second straight win. Alec Nunes scored the game-winner in the 52nd minute, taking a pass from Kyle Aubin and blasting a shot from range to put the Tigers ahead 1-0. Mateusz Hagemajer scored the next two goals, first off an assist from Brett Beaulieu in the 55th minute and then unassisted in the 67th minute. THS coach Taylor Whitters said Liam Crowley and Charlie Fiske also played well for the Tigers while Nolan Melo recorded his second shutout of the season. Oliver Ames, 1 @ Mansfield, 1 – Final – Mansfield jumped ahead just moments into the second half but Oliver Ames knotted the score just over 10 minutes later as the Hornets and Tigers finished level. Junior Owen Mullahy put the hosts in front, heading in a cross in the 42nd minute. Oliver Ames’ Kevin Louhis tied the game in the 55th minute, tucking his shot inside the near post. Louhis collected a loose ball after a volley from sophomore Colin Milliken hit off the crossbar and bounced into the area. North Attleboro, 1 @ Milford, 1 – Final – North Attleboro senior Joe Hilf gave the visitors the lead with a goal from distance but Milford found the equalizer midway through the second half to earn a draw at home. Hilf put Big Red ahead just over the midway point of the first half with a hard shot from distance. In the second half, Milford junior Omar Lema scored his first career goal off an assist from Walisson de Oliveira, tying the game in the 60th minute. King Philip, 3 @ Attleboro, 0 – Final – Avery Snead scored once and assisted on another, as KP remained on top in the Kelley-Rex with the win. Makayla Griffin scored inside the opening 10 minutes, on a Snead assist, for what turned out to be the game-winner. Snead double the lead in the second half with a shot from just inside the 18 and Jenny Montville sealed the win on a through ball by Ally Stanton. Attleboro goalie Tayla Drape made 12 saves to keep the Bombardiers in the game and earned praise from both coaches. Stoughton, 0 @ Foxboro, 7 – Final – Foxboro senior Kenzi Fraser exploded for four goals and one assist to lead the Warriors to a big win at home. Jordyn Collins, Kendra Wentling, and Lizzy Davis (goal) all had an assist while Kailee McCabe scored off a feed from Fraser. Freshman Kaitryn Franchino capped with the scoring with an unassisted tally. Franklin, 4 @ Taunton, 0 – Final – Sydney St. Marie scored a pair of goals, Calen Frongillo had a pair of assists and Hailey Toolin had a goal and an assist for the Panthers. Stella Regan also had a goal and Sabrina Addi had an assist in the win. Milford @ North Attleboro – Postponed to date and time TBD. Mansfield, 1 @ Oliver Ames, 0 – Final – Steph Kemp scored the only goal of the game to keep Mansfield unbeaten in the league this season. For Oliver Ames, head coach Britt Sellmayer said Emma O’Donnell had a great game in net and credited Anna Tempestoso and Abby Hodges with strong games. Attleboro, 0 @ King Philip, 7 – Final – Alli Meehan scored a hat trick to lead the Warriors to a win. Meghan MacDonald, Claire Lawler, Kate Lindmark, and Nicole Connor also scored for KP. Click here for a photo gallery from this game. Canton, 6 @ Sharon, 0 – Final – Canton’s Maggie Malloy scored a hat trick as the Bulldogs rolled on the road at Sharon. Shannon Crowley and Beth Oldenburg each scored once while Allie Gefteas scored her first career goal in Canton’s win. Foxboro, 3 @ Stoughton, 0 – Final – Lily Daly scored a pair of goals and assisted on a third as Foxboro notched a win on the road over Stoughton. Daly scored two goals in the first half as Foxboro took a 2-0 lead into halftime. In the second half, Daly set up Jamie Notarangelo for the third goal. Taunton, 2 @ Franklin, 2 – Final – Taunton rallied from a 2-0 deficit to grab a point on the road with the draw. Goals from Cassi Ronan (from Regan Paterson) and Amanda Lewandowski (from Stephanie Bell) put the Panthers ahead 2-0 at halftime. But Taunton scored twice in the second, tying the game with 10 minutes to go. Lauren Torres (from Jillian Pagliuca) made it a one goal game and then Alana Tavares tied the game. Emma Sheehan had five saves in net for the Tigers. THS head coach Liz Hathaway praised the work of her defense, including Skylar Rheaume, who made a big defensive save for Taunton. Attleboro, 0 @ King Philip, 3 – Final – King Philip defended home court with a 3-0 (25-10, 25-13, 25-14) sweep over Attleboro. For King Philip, Kat Kmetz had four kills, two aces, and 10 service points, Catherine Waldeck and Kristen Masse each added three kills, and Jessie Kornfeld and Shalya Weitzman each chipped in with three aces. Canton, 3 @ Sharon, 0 – Final – Canton went on the road and earned a 3-0 sweep (25-15, 25-17, 25-21) behind a strong all-around team performance. Nicole Brown continued to lead the Bulldogs, finishing with 18 assists, 18 digs, five kills, and an ace while Taylor Harris added seven kills, five aces, and nine digs, and Theresa O’Brien chipped in while six kills and an ace. Freshman Sydney Gallery added three kills in her first full varsity set. Foxboro, 0 @ Stoughton, 3 – Final – Stoughton notched its fourth win of the season with a 3-0 sweep (25-20, 25-16, 25-14) of visiting Foxboro. Mia Bennett was strong in the back row with 34 digs, Sasha Hyacinthe and Amaya Morris led the offense combining for 17 kills, Hanna Holden had 18 assists, and Molly Turner had a well rounded game of 15 assists, eight kills, and five aces. Oliver Ames, 3 @ Mansfield, 0 – Final – Oliver Ames fended off a furious rally attempt from Mansfield in the first set and went on to earn the sweep (26-24, 25-14, 25-20). For OA, senior Sadie Homer led the way with 21 digs, senior Sarah Litwack added 17 assists, junior Jordan Bosse finished with 10 kills, senior Grace McCallum chipped in with seven aces, and junior Mary Davenport had a strong game in the middle. For Mansfield, Greenly Kelly and Katie Dardinski each had eight service points while Emily Dardinski paced the offense with nine kills. Sharon, 162 @ Oliver Ames, 145 – Final – Oliver Ames’ Liam Barry earned medalist honors with a low-round of 35 as the Tigers handed Sharon its first loss of the season. Thomas Walsh and Tate Hadges each cared a 36 while Nolan Donze shot a 38 at Pine Oaks. Taunton, 181 @ Mansfield, 167 – Final – Sophomore Nathan Morreale shot a team-low round of 41 while three other Hornets shot 42 in a win over Taunton at Norton Country Club. Sophomores Jason See, Ava Haggis and Joseph Gormley rounded out Mansfield’s scoring each with a 42. North Attleboro, 165 @ Milford, 179 – Final – North Attleboro senior Marcus Costa shot a low-round of 38 to earn medalist honors and pace the Rocketeers on the road. Matt Wanless added a 41 for Big Red while Jillian Barend carded a round of 42.